A shocking new clip shows the dangers of driving too closely to another motorist in front of you on a motorway. 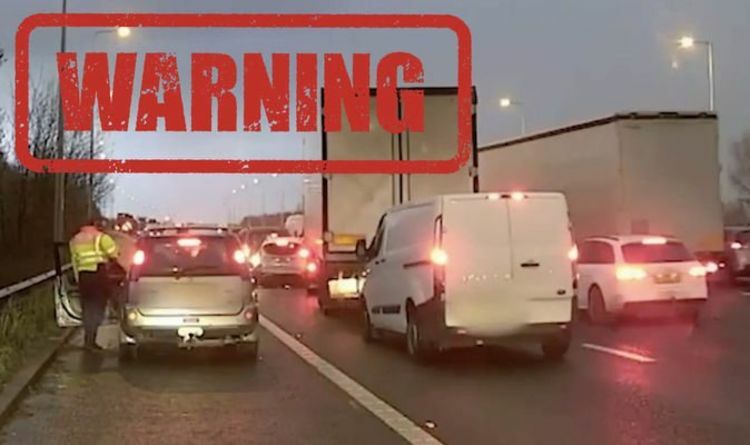 The clip, which was captured by one of the dashcams in a Highways England patrol vehicle on the M6 in Cheshire, showed the danger of travelling too close to another drive. It reveals how dangerous it can be if you do not leave space in-between the cars in front of you. The clips show several cars sharply braking causing a mass crash involving a HGV lorry. Highways England has released the clip as part of its #staysafestayback campaign. The group’s Head of Road Safety, Richard Leonard, said: “This footage is a startling reminder about the dangers of driving too closely to the vehicle in front. The general advice for motorists is to leave a two-second gap between your vehicle and the vehicle in front and double that when the road surface is wet. Reduce the risk to yourself by driving normally, signalling clearly and allowing people to overtake. Drivers caught tailgating can be fined £100 and be given three penalty points. EastEnders spoilers: Jane Beale for shock comeback in bitter clash with Mel Owen?